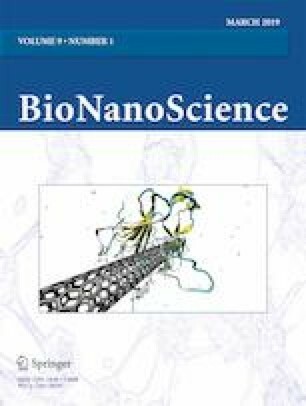 Very small-sized silver nanoparticles (Ag-NPs) have been synthesized from dried leaf extract of Diospyros montana in aqueous medium. They have been characterized by various spectroscopic techniques (UV-Vis, FTIR spectroscopy), SEM, TEM, and EDX analyses. Particle size has been analyzed by Zetasizer. Their antibacterial screening has also been done against nine pathogenic bacterial strains. Formation of Ag-NPs was confirmed from a sharp absorption peak at 421 nm in the UV-Vis region of the spectrum. Its FTIR spectrum showed sharp ʋ(C=O) at 1635 cm−1 due to the presence of quinonoid type molecule in the extract which undergoes decrease in intensity after NP formation. Although three types of NPs were detected, their average diameter was found to be 61.69 nm. The particles of largest size were in abundance. However, from TEM analysis, five different types of NPs varying in shape and size (7.44, 13.10, 18.20, 8.90, and 10.60 nm) have been detected. SEM analysis showed that NPs were irregular in shape. EDX analysis showed sharp signal for Ag-NPs which suggest their crystalline structure. Their antibacterial activity was done on nine different bacterial strains using agar well and disk diffusion method according to CLSI guidelines. Maximum activity of Ag-NPs was observed against Klebsiella pneuomoniae and Escherichia coli while moderate efficacy was seen in other bacteria. Resistant pattern was also observed against Streptococcus viridans and S. mutans. Our study suggests that Ag-NPs can act as an antibacterial agent. We acknowledge with thanks the assistance provided by the University Sophisticated Instrument Facility (USIF) and the Department of Microbiology, Jawaharlal Nehru Medical College & Hospital, Aligarh Muslim University, Aligarh, India. Thompson, J. (1948). The correlation of vibrational absorption spectra with molecular structure. Journal of the Chemical Society, 328. https://doi.org/10.1039/JR9480000328.